The soldiers must feel good knowing we finally have a president that really supports them. 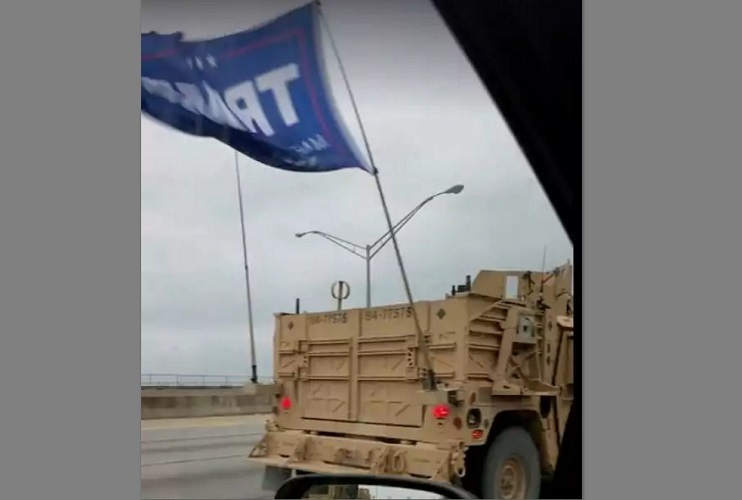 It’s official: The military convoy seen flying a Trump flag in Louisville on Sunday belonged to a Navy Special Warfare unit, and the flag was “unauthorized,” a Navy spokeswoman said. Lt. Jacqui Maxwell of the Naval Special Warfare Group 2 in Virginia Beach, Virginia, said a command inquiry is underway. She said she did not know the potential penalties for the violation. Some motorists said they were alarmed by military units flying the flag of a national leader rather than the country, which they said is reminiscent of a fascist government or banana republic.